2017 has been an exceptional year for foraging. 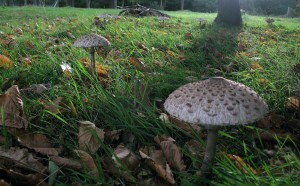 We are now in the tail end of autumn and the mushroom season should be coming to an end. But where I pick my dinner, it seems they just keep on raising their curious heads, demanding to be plucked. We’ve been eating Parasols and Shaggy Parasols ( macrolepiota procera and macrolepiota rhacodes respectively) for a good three months now, and they’ve been more delicious than in previous years, possibly because this year the rain has fallen in this country at all the wrong times! Some of the tufts on the cap will wash off, but it’s not imperative you remove them. They’re edible. Quite rightly, the Brits are very cautious about foraging for mushrooms, entirely because the tradition and ability to identify the safe varieties has been lost. If you find a woodland that’s been cleared, it will probably be the Eastern Europeans who are enjoying the fruits of the harvest. Those I meet laden with produce are continually surprised at our refusal to trust anything not packaged in a plastic tray and clingfilm, and sold through a supermarket. 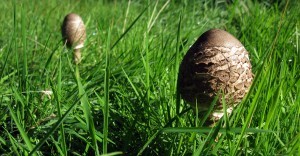 Yet edible varieties aren’t that difficult to identify if you forage with an excellent handbook like the Collins Nature Guide to Mushrooms and Toadstools. And there is a failsafe – when frying them, if the oil turns yellow, chuck ’em! 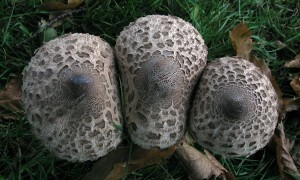 Parasol Mushrooms before they open out. I have a preference for Parasols because they are scrummy fried with a few onions and garlic, but equally excellent in stews where they soak up flavours and are chewy, reminding me of the beef I ate before turning veggie. For somebody like myself who is colourblind, they are also so easy to identify. Remove the stalks, give them a good rinse (and you can squeeze them like a cloth to wring out the water) then chop. If you pick them before they open out, when they are shaped like a fat sausage, they can be stuffed and baked. Otherwise, go for the open ones that have brilliant white gills underneath. They’re at their freshest.